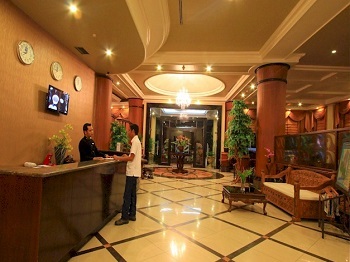 Gorontalo hotels are located in Gorontalo City. The trip from the Gorontalo’s Jalaluddin Airport takes about one hour. We include airport transfers in our scuba diving packages. Gorontalo has budget, business and star-rated hotels. Divers will find the star-rated Grand Q Hotel the best among Gorontalo hotels. Formerly, Quality Hotel was its name prior to its recent sale. The new owners are building new rooms, a swimming pool, fitness center and spa. As with most Gorontalo hotels, various types of rooms are available. Most scuba divers request Superior rooms. These have double or twin beds, a/c, hot water shower, international cable TV and minibar. Deluxe rooms offer a connecting door between rooms for families. Additionally, the hotel offers junior suites. In the basement is the hotel’s pub, which features live music. None of the other Gorontalo hotels have a pub. Also, this hotel has a wine bar. Grand Q offers an excellent breakfast buffet in the hotel’s dining area. Free WIFI is available. New Melati Hotel is a long favorite of travelers. Located on the public square, it is built around a central outdoor courtyard. Although the hotel is over 100 years old, it has new Deluxe rooms, which we recommend. Rooms have double or twin beds, a/c, hot water shower. Breakfast is served in the hotel’s dining area. Free WIFI is available in the lobby. Also, the hotel provides information to travelers going to the Togian Islands. For backpackers who wish to dive, we can arrange very inexpensive rooms among a few Gorontalo hotels . Visitor can easily navigate Gorontalo City and its numerous local restaurants. Fresh seafood is inexpensive and delicious. For those longing for something western, Magic Pan Pizzeria opened in 2012 in a beautifully renovated Dutch-area house. It is a short walk from Grand Q hotels. Hypermart opened in 2012 and offers imported foods. Guests of Miguel’s Diving are given a map of Gorontalo City. It is the only tourist map available. It includes locations of Gorontalo hotels and restaurants that we recommend. On three-dive days Miguel’s Diving provides lunch. It is served on board or on the beach. For divers, departure from the hotel is about 0730. Return is between 1500 and 1600 hrs on three-dive days. The dock is about 10 minutes from most Gorontalo hotels. 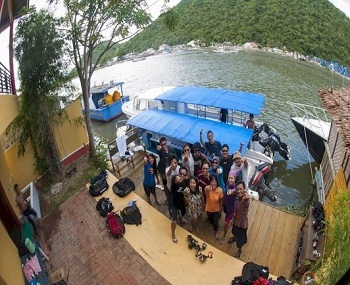 Miguel’s Diving owns the only private dock in Gorontalo. During the short drive to the dock, divers pass through the center of Gorontalo City. This friendly Sulawesi town feels more like a village. Its streets are swept clean every morning. Upon arrival at the dock, divers discover that their equipment is already set up and waiting. Then divers board one of our speedboats. These are custom-built for diving. Within fifteen minutes from our dock is a cluster of seven dives sites. These sites feature two wrecks, coral walls, muck, slope with pinnacles and coral steps. Other dive sites in Gorontalo feature overhangs and caverns. Miguel’s Diving currently offers over 30 varied dive sites. Dive sites for the day depend on diver interest and ocean conditions. The farthest site is one hour away. Dive staff set up and wash your scuba equipment at the end of every diving day.